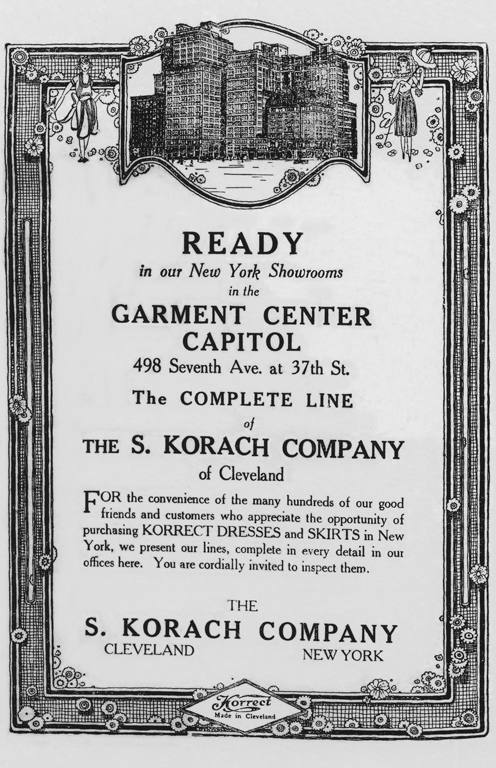 S. Korach Company Advertisement, Women's Wear, July 26, 1921. Courtesy of Center for Research Libraries. 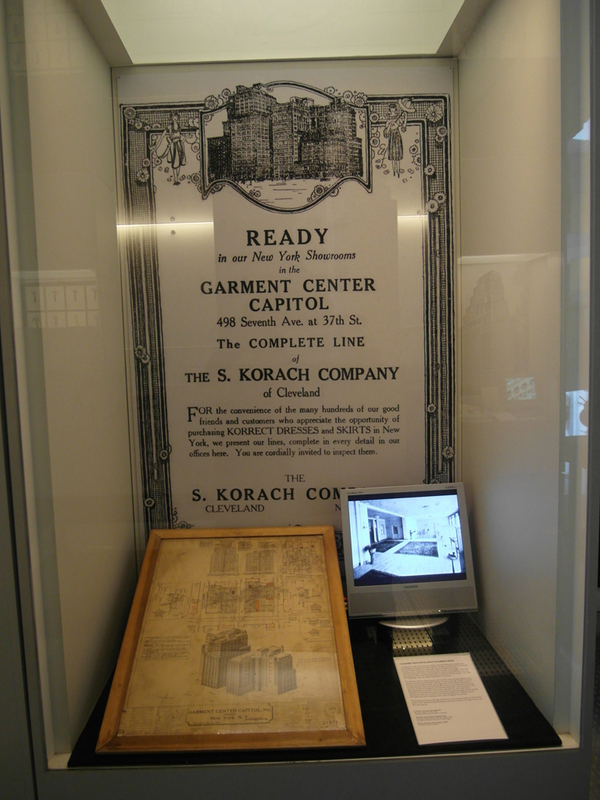 To establish a new center for the industry, two manufacturers, cloakmaker Saul Singer and dressmaker Mack Kanner, devised a radical plan to create the Garment Center Capitol-a cooperative factory complex with major manufacturers investing in the construction of a pair of buildings on Seventh Avenue flanking 37th Street. Comprising 1.5 million square feet and housing, according to a New York Times estimate, more than 15,000 workers, this was the largest garment-manufacturing center in the world. The Garment Center Capitol was a monumental undertaking designed by an obscure architect named Walter Mason. The two buildings, rising 17 and 23 stories, were entirely fireproof, with large, open floors easily subdivided for multiple tenants. Stores occupied the ground floor and showrooms, such as that of S. Korach of Cleveland, who proudly advertised their showroom in the advertisement on the back of this case, occupied the next three floors. Factories and offices were above. Amenities included package shoots leading directly to a mail room; interior truck loading platforms; a rooftop club for manufacturers with a banquet room; and a hospital for workers. 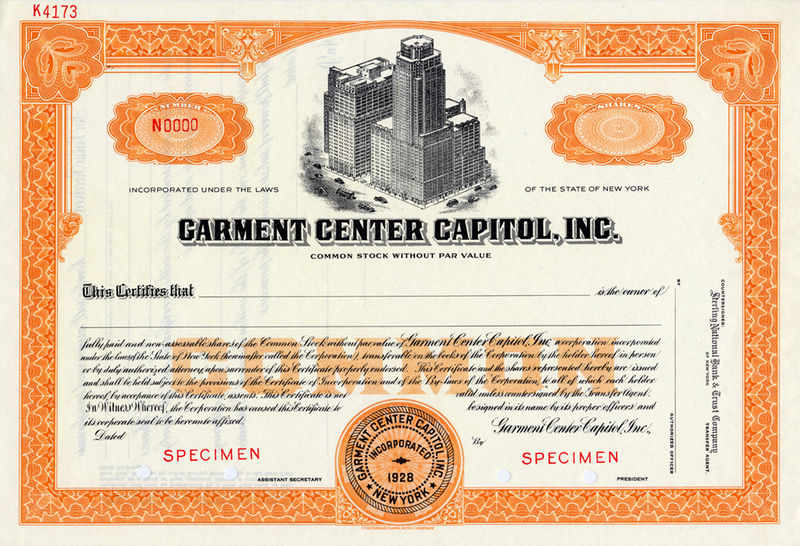 Garment Center Capitol Building Stock Certificate, 1928. Collection of The Skyscraper Museum. The success of these buildings led directly to the transformation of the blocks north of 34th Street between Broadway and Ninth Avenue into New York's new Garment District.